In the meantime, our final entry on the FilmStruck platform is going live on Monday, 19 November. There I consider Julien Duvivier’s Lydia (1941) as an example of the power of flashback storytelling. I talked about the film in Reinventing Hollywood as part of the massive 1940s revival of this technique. 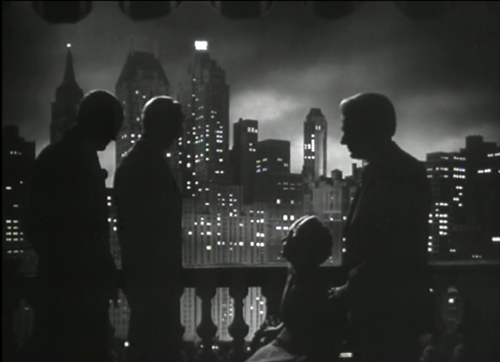 Critics’ long-standing emphasis on film noir has led us to think that that trend epitomized flashback construction, but actually the technique is almost completely general. In the book, I consider several “women’s pictures” that employ it: Kitty Foyle (1940), The Affairs of Susan (1945), The Locket (1946; also discussed here), and Lydia. The Criterion series allows me to illustrate more concretely how Duvivier and his colleagues tell the story of a woman captured by passion and moving into old age almost (but not completely) disillusioned. Duvivier was sometimes disdained by the younger generation as an old-guard academic, but I’ve come to see him as a rather interesting experimentalist. He tried out a day-in-the-life network narrative (Sous le ciel de Paris, 1951), a charming what-if comedy about screenwriting (La Fête à Henriette, 1952), and a solid Gabin polar (Voici les temps des assassins, 1954). His suspense drama Marie-Octobre (1959), might seem overly theatrical because it has a Rope-like confinement to a single evening, an anniversary dinner for survivors of the Resistance, but it’s actually based on a novel and gains tension from its almost real-time duration. It showcases a range of major stars (Darrieux, Blier, Reggiani, Ventura) and boasts one of the most dazzling parlor sets I’ve seen in a long while. Among his thrillers adapted from English authors there’s the curious Chabrolian exercise, La Chambre ardente (1962), based on a John Dickson Carr novel, and the seedy Chair de poule (aka Highway Pickup, 1963, below) from James Hadley Chase. I’m sure there are clunkers and potboilers among his dozens of titles, but it’s a pretty distinguished career, running back to the silent cinema and his early classic Poil de carotte (1925). His department-store drama, Au Bonheur des Dames (1930), exemplifies bravura silent-film style at its height. He even remade The Golem (1936). For me, Lydia encapsulates the ambitions typical of Duvivier and 1940s Hollywood. The film could count as a rewrite of Carnet du bal (1937), his story of a woman who revisits the men who danced with her one night in her youth. That plot might seem to demand a string of flashbacks, but instead it’s all played in the present. Her confrontation with what the dashing young men have become leads to a string of extraordinary encounters enacted by top players of the day (Rosay, Bauer, Fernandel, Raimu, Jouvet, Sylvie). 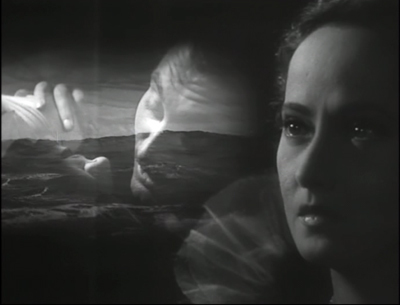 The melancholy tone, involving a mournful devotion to impossible love, is reminiscent of Dreyer’s Gertrud. Lydia takes the alternative option of actually dramatizing the memories of the heroine and her three lovers as they reflect on the old days. The flashbacks are daringly introduced with straight cuts and curt sound bridges; a couple of scenes use slow-motion for the past, a very unusual choice for the period. The soundtrack is unusually lush, with the brilliant Miklós Rózsa supplying lilting waltzes and even some early electronic effects. For a bold montage merging Lydia’s passion with that of the raging sea, he came up with a fierce piano concerto. The film plays on the disparities of time and memory in a rather modern way. Flashbacks contradict one another, and what we see doesn’t always match what the voice-over tells us. Lydia in the present seems to whisper advice to the girl we see in the past, as if she’s watching the film along with us. The climax is quietly devastating: the twist was demanded by censorship, but producer Alexander Korda claimed, rightly, that it improved the film. We’re left wondering how much to trust Lydia’s memory of her idealized affair. One thing that didn’t make it into our entry: Discussion of the peculiar cottage where Lydia and her lover Richard share their passionate idyll. It seems to be built out of the bodies of big naked people. So I share one image with you, below. Apart from that, I hope you get to play my installment, in the waning days of FilmStruck, or maybe cached on the new Criterion Channel in the spring. You can sign up for that streaming service here, and the sooner you do it, the easier it will be to launch. We’re grateful as usual to Peter Becker, Kim Hendrickson, Grant Delin, and the whole Criterion team, and to Erik Gunneson of the UW Department of Communication Arts. Special thanks to Daniel Reis, editor of most of our installments, whose adroit cutting strengthened them enormously. (The Lydia entry masterfully stitches together disparate sequences using Lydia’s dialogue as a voice-over.) Other entries were cut by the equally gifted Clyde Folley. Thanks as well to Kelley Conway and Phillip Lopate for conversations about Duvivier. Criterion has served Duvivier well, offering several of his works on DVD. A list of our Observations installments to date is here. 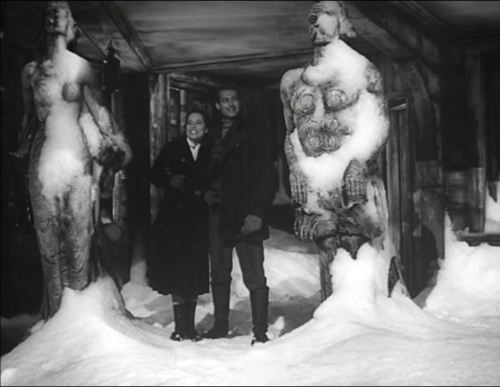 Lydia (1941): A house embellished with ships’ figureheads becomes the lovers’ sanctuary.